Indian Journal of Research in Homoeopathy, a publication of Central Council For Research In Homoeopathy, is a peer-reviewed online journal with Quarterly print on demand compilation of issues published. The journal does not charge for submission, processing or publication of manuscripts and even for color reproduction of photographs. Whole Homoeopathic Fraternity in India is proud of Dr.Manoj Rajoria from Rajasthan. We congratulate you on your success and becoming MP, You will be the voice of thousands of Homoeopaths in the Parliament. You are a dedicated Homoeopath and we know you will work for Homoeopathy too. 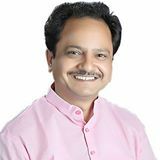 Dr Manoj Rajoria, Candidate of 15th Lok Sabha, Affiliated to Bharatiya Janata Party (BJP) serving Karauli Dholpur (RJ) Lok Sabha Constituency. Ministry of Health and Family welfare has asked for review of Draft of Minimum standards for Clinical Establishments under Clinical Establishments Act. National Council for Clinical Establishments under the Chairmanship of Director General of Health Services, Government of India in consultation with various stakeholders has prepared draft minimum standards for various categories of Clinical Establishments for implementation of the Clinical Establishments Act. The comments may kindly be sent to Dr. Anil Kumar, CMO(AK) Room No.506 ‘D’ Wing, 5th Floor, Nirman Bhawan, New Delhi-110018 at his email- id dr.anilkumar@nic.in with in one month of publication of this Notice on the website. Note : The Indian Public Health Standards(IPHS) four Sub-centre, PHC, CHC, Sub-district/Sub-divisional hospital and District hospital are already approved documents. The comments are being invited only on the draft minimum standards and not on the IPHS.